Writing and Teaching Graphic Memoirs. | Une année sans alcool ! Petite intermission cette semaine pour préparer ma conférence, à l’Université Stanford. Je suis invitée par le groupe « Gaphic Narrative Project ». J’y parlerai entre autres de mon expérience avec ce blogue Une année sans alcool. Le journal de Catherine. Voici l’annonce de la conférence. Graphic memoirs provide an important window into changing cultural landscapes through their form, allowing for the combination of images of everyday life with colloquial language. Dr. Danièle Archambault, a linguist and cartoonist, as a graphic memoir author documented the culture and language of Québec in the 1950’s, the last years of the so-called Great Darkness. In subsequent years she has taught others how to write graphic memoirs, further enabling her understanding of the varying constitutions of cultural heritage. Through reflecting on her current experience as the author of the webcomic blog Une année sans alcool (A Year without a Drink), she will trace the trajectory of her stories from personal reflections to acts of social questioning, and from what she initially understood as simply a publishing platform to what she now regards as a new form of interactive art. 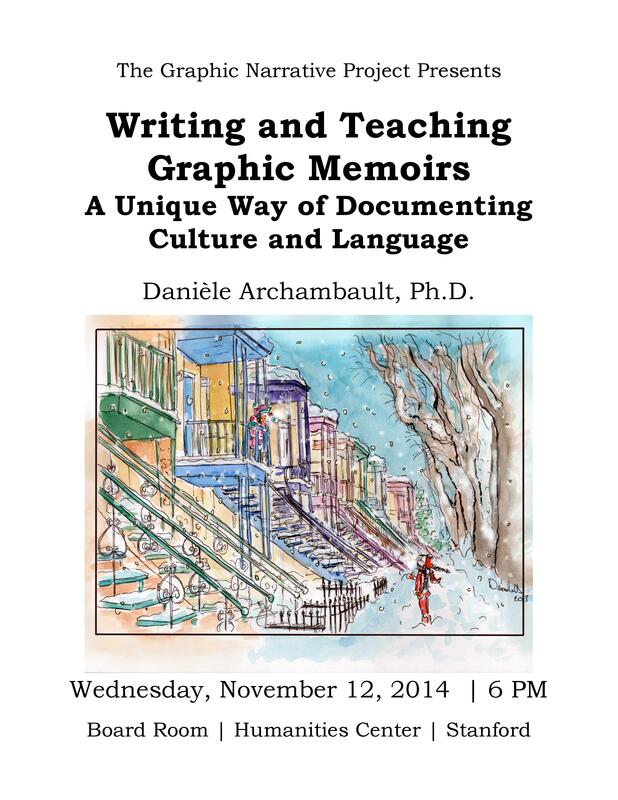 Danièle Archambault, Ph.D. (Linguistics) is a researcher, author, and educator who is interested in comics as a way to document a society’s cultural and linguistic landscape. She is the author of three graphic memoir series: Stairway stories, Québec-California, and Une année sans alcool. Originally from Montréal, she now lives in Palo Alto, where she is artist-in-residence.